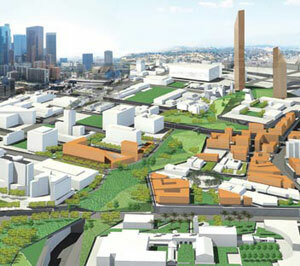 The Architect’s Newspaper writes that plans for freeway cap park are moving forward in Los Angeles County. The cap idea involves covering parts of a freeway with a “planted concrete lid.” The freeway cap parks are designed to reconnect neighborhoods cut off by freeways and create green community spaces through the city. Additionally, the cap parks will help reuse existing infrastructure and avoid the enormous costs involved in pulling down freeways. The parks would function as a sort of High Line, but instead of residing on top of abandoned rail road tracks, would be placed on working transportation systems. Among the four cap park proposals, the Hollywood Freeway Central Park project is furthest along and has just completed initial feasibility studies, developed by AECOM. The Friends of Hollywood Central Park are now raising funds for detailed environmental impact assessment studies. Early estimates put the cost of the proposed Hollywood Central cap park in the range of one billion. L.A. Curbed writes that Santa Monica is also moving forward with one of the cap parks. The city council is voting on $3.5 million study and preliminary engineering on a proposed five-acre park. Read the article and see AECOM’s design concepts. The parks sound like a great idea. Except it’s a little scary thinking about what happens to them if there is a big earthquake. The downtown one is a great idea. I’ve been there, and that area is badly severed. However, they need to fit in through tracks for Union Station and a new second level to Union Station with its own through tracks for HSR… this seems like one complicated project to build. $1 Billion is a lot of money for a park! I love parks, but $1 Billion? It is definitely the direction, and began with Halprin’s Freeway Park and onto Duluth’s Lake Place. I found this post to be very interesting. As a resident of Los Angeles I have always wanted to have a central park or even smaller parks spread out across the city. Unlike San Francisco, New York and other major cities, Los Angeles is unfortunate not to have a great public park system such as Golden State Park and Central Park. The plan for new free cap parks is very exciting for the future of Los Angeles. I fully support the idea of placing “planted concrete lids” to cover parts of the city. This would allow neighborhoods to reconnect with each as well as create green, walk-able spaces across the city. As you mentioned this will also allow the reuse of existing infrastructure and avoid the costs of removing the freeways. Although I am excited about the plan for cap parks, I question the feasibility with a project that comes with over a billion-dollar price tag. Don Scott, an investment banker former chairman of the Hollywood Central Park coalition and former chairman of the Hollywood Chamber of Commerce is one of the biggest supporters of the cap park. He said that much of his inspiration came from the Boston’s Big Dig. Boston’s Big Dig is viewed by some as one of the biggest failure in recent construction history. It was the most expensive project in United States history going six billion dollars over budget. While the Big Dig was a massive infrastructure project and the cap freeway project has much of the infrastructure already built it still comes at a hefty price tag. There needs to be a more economical and equitable way of implementing these freeway parks. I propose privatizing the separate projects. This would certainly cut back on the costs and time, as private projects will not have to deal with bureaucracy and time-consuming process of government jobs. The cap park is the future of Los Angeles and could add value to areas surrounding the parks and to the city of Los Angles as a whole. There are still some issues that need to be solved, but it is the beginning of the planning process. I look forward to seeing their development in the future.